A confession: the title of this post is lifted directly from an irresistibly enthusiastic history of butter packaging [PDF], prepared by one Milton E. Parker in 1948, for the Packaging Machinery Division of the Lynch Corporation, which I stumbled across while trying to find out how the EU butter molehill is stored. 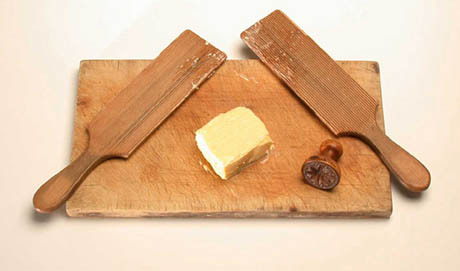 IMAGE: Traditional butter pats, via. Granting atomic fission is completely terrible, and […] its sheer power staggers the imagination, we must, nevertheless, recognize that when it comes to molecular energy, butter is still king. 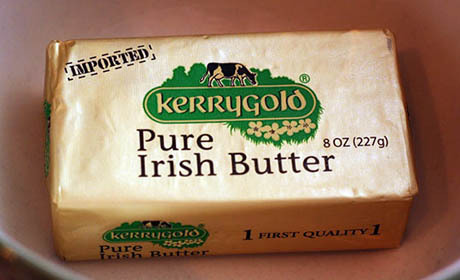 For, as Dr. George R. Harrison has pointed out, one pound of butter contains the equivalent of 18,000 B.T.U.’s, while one pound of coal yields 16,000 B.T.U.’s, one pound of TNT lays claim to 2,400 B.T.U.’s, and one pound of uranium (the basic element of the Bomb) can muster only 2,300 B.T.U.’s. 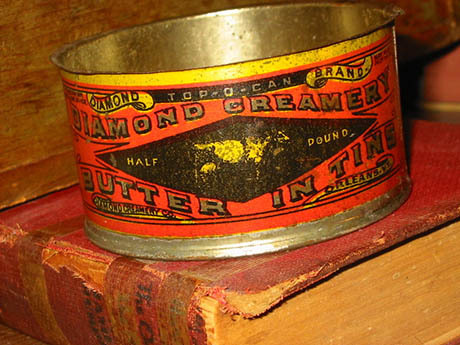 IMAGE: Tinned butter, originally developed to satisfy the demands of gold miners in the Yukon for fresh butter for their flapjacks, via. The story of butter packaging is, of course, also the story of urbanisation, and the concomitant need to keep food fresh over extended distances and time. As a matter of fact, it was a common practice in the earlier days of the South Water Street market in Chicago, for farmers to refrigerate their shipments of butter transported in open wagons by covering the same with grass freshly cut while still wet with dew. 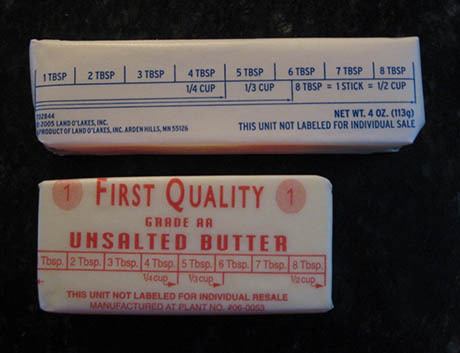 Interestingly, Parker’s history also describes butter packaging’s evolution from small, cloth-wrapped rolls or pats, typically made by a local farmers’ wife, to bulk tubs and barrels, produced in a factory creamery and shipped over increasingly large distances — and then back down in size to the individually wrapped sticks we buy today. 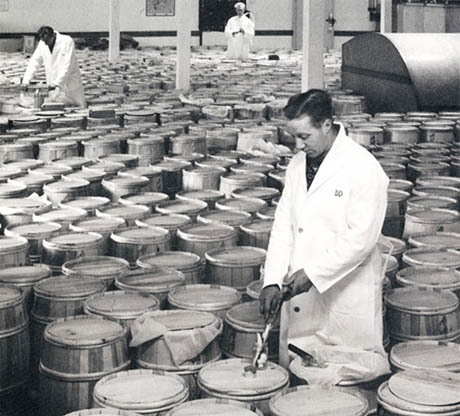 IMAGE: Sampling butter barrels at Lurpak’s Danish storage facilities, via. Parker bemoans the fact that early packaging pioneers rarely kept records as they made butter history, noting that “the question as to when and where the first creamery was started has never been satisfactorily resolved.” Nonetheless, it is clear that the advent of mechanised cream separation and railways combined to make factory-scale butter production, under the “centralized creamery system,” commonplace during the second half of the nineteenth century. 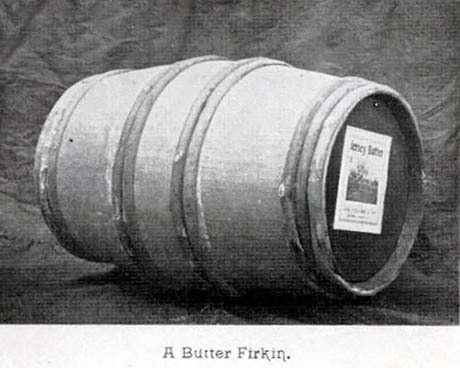 IMAGE: A butter firkin, via. 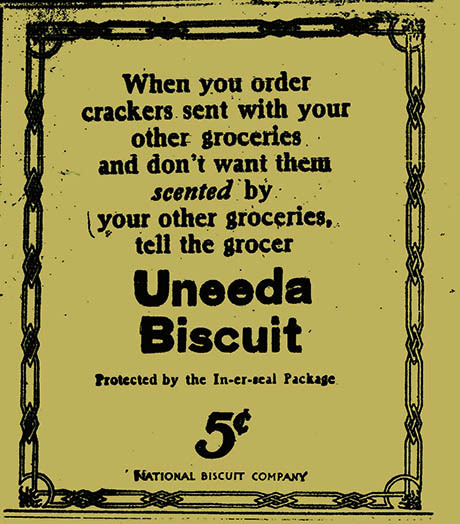 IMAGE: Uneed “In-er-seal” Package advertising, via. The Uneeda “Inner-Seal” packaging was promoted with a national advertising campaign and met with considerable commercial success. Parker’s mid-century history thus traces an entire evolution in America’s food system through the otherwise unremarkable medium of butter packaging. Incidentally, he also points out an early example of an east/west butter divide, with Vermont and northern New York championing spruce for their bulk wooden tubs, while west of the Rockies, ash was the material of choice. IMAGE: An Elgin packet above a Western stubby, via. Although both ash and spruce lost out to waxed paper in the end, that divide continues to this day, with Western butter cutting machines having settled on a shorter, fatter shape (known, rather unfortunately, as the “Western stubby”), while the Eastern market prefers longer, thinner sticks, stacked two-by-two, and known as the “Elgin” pack shape (after the Elgin Dairy, which Parker mentions as a strong contender for the title of first butter factory in America). I recently moved to where the “stubby” is the standard. I’m annoyed by the shape, even though it’s probably easier to mash into my butter bell. I love the idea that butter is to milk as enriched uranium is to ore! According to this website, enriched uranium has a heating value of 1,250,000,000 BTUs, so perhaps Dr. Harrison was incorrect, or was referring to unprocessed uranium? Hmm – I’m suspicious of the energy amounts for one pound of uranium – it sounds low; perhaps that’s for one pound of unenriched uranium, but in that case you’d want to compare it with milk if you can classify butter as the result of the enrichment process on milk. I’ve always liked the Kerrygold packaging.